Quick update! 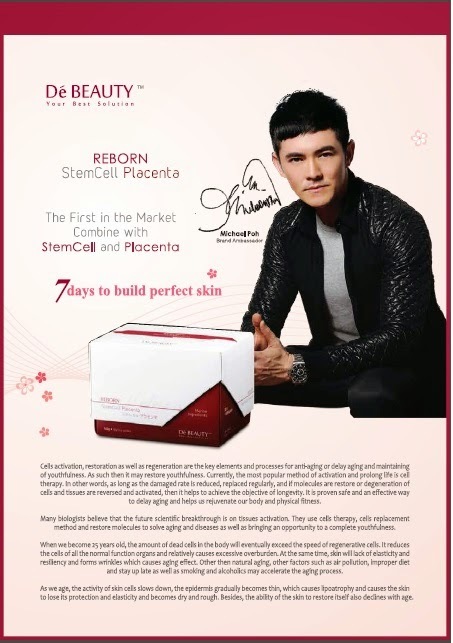 Michael Poh, Ambassador for De’Beauty Reborn StemCell Placenta , Hair & Image Consultant at Hair Zone Studio is appointed as the New Ambassador for the De’Beauty Reborn StemCell Placenta. 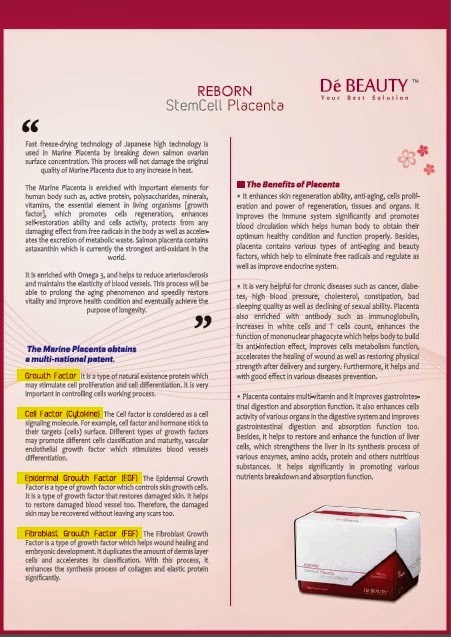 It is the first Marine Palcenta and Natural Algae Stem Cells beauty skin beverage in Malaysia. De’Beauty Reborn StemCell Placenta contains 18 kinds of amino acids, collagen, elastin, hyaluronic acid, chondroitin, nucleic acid(DNA & RNA), superoxide dismutase (SOD), immune co-factor, peptide of placenta, epidermal growth factor(EGFs), senescent cell activating factor (SCAFs) and Vitamin B complex. 1. Protects, repairs and regenerates cells. 2. Mitalizes fibroblast cells to produce collagen glycosaminoglycan, elastic fibers and glycoprotein. 4. Liquid form, easier absorb and utilize by body. 5. 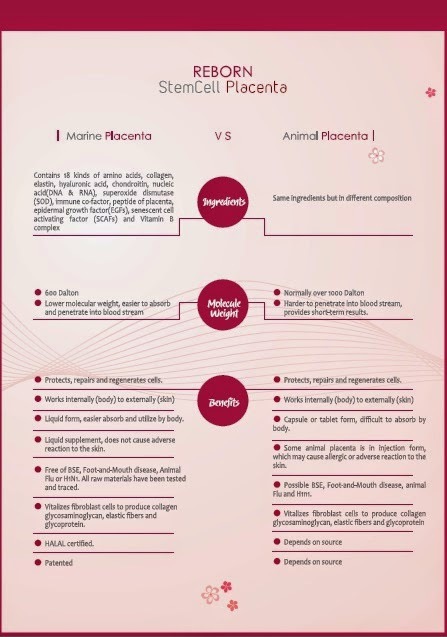 Liquid supplement, does not cause adverse reaction to the skin. 6. Free of BSE, Foot-and-Mouth disease, Animal Flu or H1N1. All raw materials have been tested and traced. 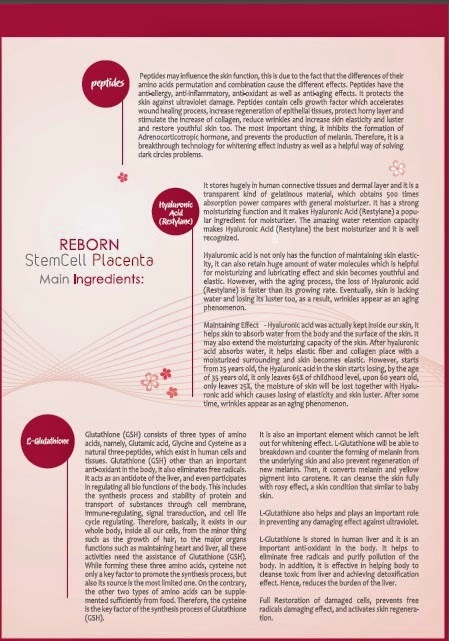 Items mentioned in "DeBeauty Reborn Collagen Plus" are not sponsored or endorsed unless mentioned otherwise. Every product I review on this blog has sincerely been tested and used by company. Hence, it's my honest and personal take on every item reviewed.